Ocean waters are becoming warmer and more acidic, broadly affecting ocean circulation, chemistry, ecosystems, and marine life. Rising sea surface temperatures have been linked with increasing levels and ranges of diseases in people and marine life. Explore how climate change is affecting the oceans and marine resources. As a nation, we depend on the oceans for seafood, recreation and tourism, cultural heritage, transportation of goods, and, increasingly, energy and other critical resources. The U.S. Exclusive Economic Zone extends 200 nautical miles seaward from the coasts, spanning an area about 1.7 times the land area of the continental U.S. and encompassing waters along the U.S. East, West, and Gulf coasts, around Alaska and Hawai‘i, and including the U.S. territories in the Pacific and Caribbean. This vast region is host to a rich diversity of marine plants and animals and a wide range of ecosystems, from tropical coral reefs to Arctic waters covered with sea ice. A central component of the assessment process was the Oceans and Marine Resources Climate assessment workshop that was held January 23-24, 2012, at the National Oceanographic and Atmospheric Administration (NOAA) in Silver Spring, MD, and simultaneously, via web teleconference, at NOAA in Seattle, WA. In the workshop, nearly 30 participants took part in a series of scoping presentations and breakout sessions that began the process leading to a foundational Technical Input Report (TIR) entitled “Oceans and Marine Resources in a Changing Climate: Technical Input to the 2013 National Climate Assessment.”1 The report, consisting of nearly 220 pages of text organized into 7 sections with numerous subsections and more than 1200 references, was assembled by 122 authors representing governmental agencies, non-governmental organizations, tribes, and other entities. The key message is supported by extensive evidence documented in Sections 2 and 3 of the Oceans Technical Input Report1 and in the additional technical inputs received as part of the Federal Register Notice solicitation for public input, as well as stakeholder engagement leading up to drafting the chapter. Relevant and recent peer-reviewed publications,2,3,4,5,6 including many others that are cited therein, describe evidence that ocean temperature has risen over the past century. This evidence base includes direct and indirect temperature measurements, paleoclimate records, and modeling results. There is accumulating new information on all of these points with regard to physical and chemical changes in the ocean and resultant impacts on marine ecosystems. Both measurements and model results are continuing to sharpen the picture. A significant area of uncertainty remains with regard to the region-by-region impacts of warming, acidification, and associated changes in the oceans. Regional and local conditions mean that impacts will not be uniform around the U.S. coasts or internationally. Forecasting of regional changes is still an area of very active research, though the overall patterns for some features are now clear. Large-scale and recurring climate phenomena (such as the El Niño Southern Oscillation, the Pacific Decadal Oscillation, and the Atlantic Multidecadal Oscillation) cause dramatic changes in biological productivity and ecosystem structure and make it difficult to discern climate-driven trends. 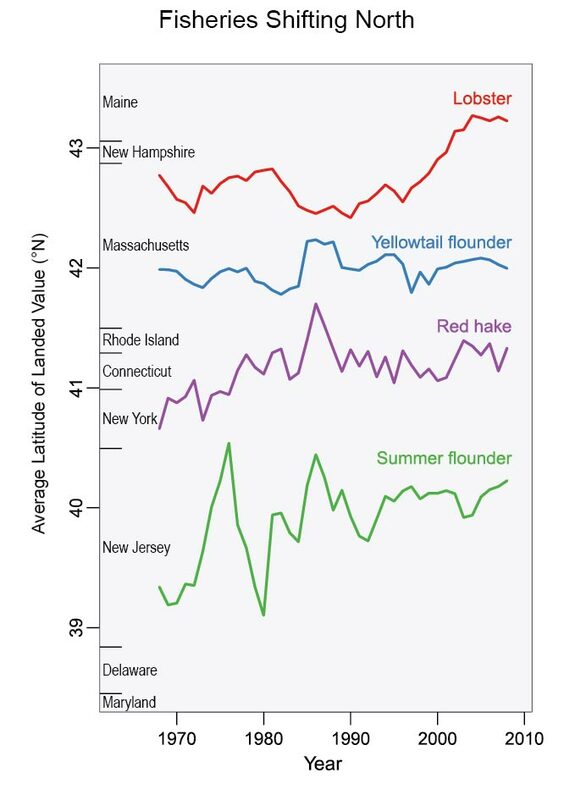 Confidence that the ocean is warming and acidifying, and that sea level is rising is very high. Changes in other physical and chemical properties such as ocean circulation, wave heights, oxygen minimums, and salinity are of medium confidence. For ecosystem changes, there is high confidence that these are occurring and will persist and likely grow in the future, though the details of these changes are highly geographically variable. While the long-term global pattern is clear, there is considerable variability in the effects of climate change regionally and locally because oceanographic conditions are not uniform and are strongly influenced by natural climate fluctuations. Trends during short periods of a decade or so can be dominated by natural variability.33 For example, the high incidence of La Niña events in the last 15 years has played a role in the observed temperature trends.34 Analyses35 suggest that more of the increase in heat energy during this period has been transferred to the deep ocean (see also Ch. 2: Our Changing Climate). While this might temporarily slow the rate of increase in surface air temperature, ultimately it will prolong the effects of global warming because the oceans hold heat for longer than the atmosphere does. Interactions with processes in the atmosphere and on land, such as rainfall patterns and runoff, also vary by region and are strongly influenced by natural climate fluctuations, resulting in additional local variation in the observed effects in the ocean. Marine ecosystems are also affected by other human-caused local and regional disturbances such as overfishing, coastal habitat loss, and pollution, and climate change impacts may exacerbate the effects of these other human factors. The key message is supported by extensive evidence documented in the Oceans Technical Input Report1 and additional technical inputs received as part of the Federal Register Notice solicitation for public input, as well as stakeholder engagement leading up to drafting the chapter. The interplay of environmental stressors may result in “surprises” where the synergistic impacts may be more deleterious or more beneficial than expected. Such synergistic effects create complexities in predicting the outcome of the interplay of stressors on marine ecosystems. Many, but not all, calcifying species are affected by increased acidity in laboratory studies. How those responses will cascade through ecosystems and food webs is still uncertain. Although studies are underway to expand understanding of ocean acidification on all aspects of organismal physiology, much remains to be learned. Confidence is very high that carbon dioxide emissions to the atmosphere are causing ocean acidification, and high that this will alter marine ecosystems. The nature of those alterations is unclear, however, and predictions of most specific ecosystem changes have low confidence at present, but with medium confidence for coral reefs. Atmospheric carbon dioxide (CO2) has risen by about 40% above pre-industrial levels.13,44 The ocean absorbs about a quarter of human-caused emissions of carbon dioxide annually, thereby changing seawater chemistry and decreasing pH (making seawater more acidic) (Ch. 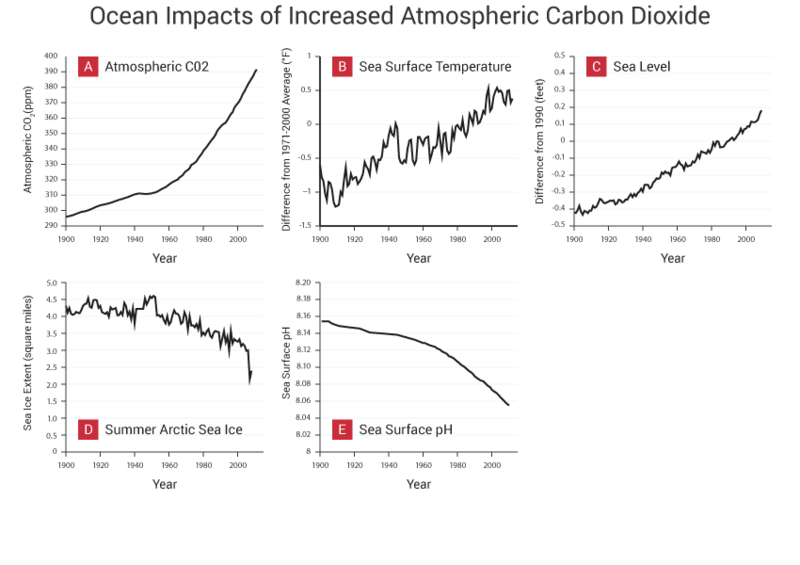 2: Our Changing Climate, Key Message 12).36,45 Surface ocean pH has declined by 0.1 units, equivalent to a 30% increase in ocean acidity, since pre-industrial times.46 Ocean acidification will continue in the future due to the interaction of atmospheric carbon dioxide and ocean water. Regional differences in ocean pH occur as a result of variability in regional or local conditions, such as upwelling that brings subsurface waters up to the surface.37 Locally, coastal waters and estuaries can also exhibit acidification as the result of pollution and excess nutrient inputs. Pteropods, or “sea butterflies,” are eaten by a variety of marine species ranging from tiny krill to salmon to whales. The photos show what happens to a pteropod’s shell in seawater that is too acidic. On the left is a shell from a live pteropod from a region in the Southern Ocean where acidity is not too high.42 The shell on the right is from a pteropod in a region where the water is more acidic. More acidic waters create repercussions along the marine food chain. For example, calcium carbonate is a skeletal component of a wide variety of organisms in the oceans, including corals. The chemical changes caused by the uptake of CO2 make it more difficult for these living things to form and maintain calcium carbonate shells and skeletal components and increases erosion of coral reefs,47,48 resulting in alterations in marine ecosystems that will become more severe as present-day trends in acidification continue or accelerate (Ch. 22: Alaska; Ch. 23: Hawai‘i and Pacific Islands).38,39,40,41 Tropical corals are particularly susceptible to the combination of ocean acidification and ocean warming, which would threaten the rich and biologically diverse coral reef habitats. Ocean acidification has already changed the way shellfish farmers on the West Coast conduct business. For oyster growers, the practical effect of the lowering pH of ocean water has not only been to make the water more acidic, but also more corrosive to young shellfish raised in aquaculture facilities. Growers at Whiskey Creek Hatchery, in Oregon’s Netarts Bay, found that low pH seawater during spawning reduced growth in mid-stage larval (juvenile) Pacific oysters.51 Hatcheries in Washington State have also experienced losses of spat (oyster larvae that have attached to a surface and begun to develop a shell) due to water quality issues that include other human-caused effects like dredging and pollution.52 Facilities like the Taylor Shellfish Farms hatchery on Hood Canal have changed their production techniques to respond to increasing acidification in Puget Sound. These impacts bring to light a potential challenge: existing natural variation may interact with human-caused changes to produce unanticipated results for shell-forming marine life, especially in coastal regions.53 As a result, there is an increasing need for information about water chemistry conditions, such as data obtained through the use of sensor networks. In the case of Whiskey Creek, instruments installed in collaboration with ocean scientists created an “early warning” system that allows oyster growers to choose the time they take water into the hatchery from the coastal ocean. This allows them to avoid the lower-pH water related to upwelling and the commensurate loss of productivity in the hatchery. Many peer-reviewed publications58,59,60,61 describe threats to coral reefs induced by global change. There are also many relevant and recent peer-reviewed publications62,63,64,65,66,67 that discuss impacts on marine species and resources of habitat change that is induced by climate change. Regional and local variation is, again, a major component of the remaining uncertainties. Different areas, habitats, and species are responding differently and have very different adaptive capacities. Those species that are motile will certainly respond differently, or at least at a different rate, by changing distribution and migration patterns, compared to species that do not move, such as corals. Although it is clear that some fish stocks are moving poleward and to deeper water, how far they will move and whether most species will move remains unclear. A key uncertainty is the extent to which various areas will benefit from range expansions of valuable species or increases in productivity, while other areas will suffer as species move away from previously productive areas. The loss of critically important habitat due to climate change will result in changes in species interactions that are difficult to predict. There is very high confidence that habitat and ecosystems are changing due to climate change, but that change is not unidirectional by any means. Distribution, abundance, and productivity changes are species and location dependent and may be increasing or decreasing in a complex pattern. Climate change impacts such as increasing ocean temperatures can profoundly affect production of natural stocks of fish by changing growth, reproduction, survival, and other critical characteristics of fish stocks and ecosystems. For species that migrate to freshwater from the sea, like salmon, some published studies indicate earlier start of spawning migration, warming stream temperatures, and extirpation in southern extent of range, all of which can affect productivity.19,77,78 To remain within their normal temperature range, some fish stocks are moving poleward and to deeper water.62,63,64,65,66 Fishery productivity is predicted to decline in the lower 48 states, but increase in parts of Alaska.79 However, projections based only on temperature may neglect important food web effects. Fishing costs are predicted to increase as fisheries transition to new species and as processing plants and fishing jobs shift poleward.32 The cumulative impact of such changes will be highly variable on regional scales because of the combination of factors – some acting in opposite directions. Some areas will benefit from range expansions of valuable species or increases in productivity, while others will suffer as species move away from previously productive areas. Figure 24.4: A colony of star coral (Montastraea faveolata) off the southwestern coast of Puerto Rico (estimated to be about 500 years old) exemplifies the effect of rising water temperatures. Increasing disease due to warming waters killed the central portion of the colony (yellow portion in A), followed by such high temperatures that bleaching - or loss of symbiotic algae from coral - occurred from the surrounding tissue (white area in B). The coral then experienced more disease in the bleached area on the periphery (C) that ultimately killed the colony (D). (Photo credit: Ernesto Weil). The key message is supported by extensive evidence in the Oceans Technical Input Report1 and additional technical inputs received as part of the Federal Register Notice solicitation for public input, as well as stakeholder engagement leading up to drafting the chapter. The interactions among host, environment, and pathogen are complex, which makes it challenging to separate warming due to climate change from other causes of disease outbreaks in the ocean. There is high confidence that disease outbreaks and levels are increasing, and that this increase is linked to increasing temperatures. Again, there is substantial local to regional variation but the overall pattern seems consistent. Given the complexity of transportation, resource use and extraction, and leisure and tourism activities, there are large uncertainties in impacts in specific locales or for individual activities. Some businesses and communities may be able to adapt rapidly, others less so. Infrastructure impacts of climate change will also be an important part of the ability of businesses, communities, and the public to adapt. As with many other impacts of climate change, the evidence that change is occurring is very strong but the resultant impacts are still uncertain. For all of these human uses, and the associated costs and disruption, the evidence is suggestive and confidence medium on the effects of the ongoing changes in ocean conditions. Altered environmental conditions due to climate change will affect, in both positive and negative ways, human uses of the ocean, including transportation, resource use and extraction, leisure and tourism activities and industries, in the nearshore and offshore areas. Climate change will also affect maritime security and governance. Arctic-related national security concerns and threats to national sovereignty have also been a recent focus of attention for some researchers.116,117,118,119 With sea ice receding in the Arctic as a result of rising temperatures, global shipping patterns are already changing and will continue to change considerably in the decades to come.119,120,121,122 The increase in maritime traffic could make disputes over the legal status of sea lines-of-communication and international straits more pointed, but mechanisms exist to resolve these disputes peacefully through the Law of the Sea Convention and other customary international laws. Resource use for fisheries, aquaculture, energy production, and other activities in ocean areas will also need to adjust to changing ocean climate conditions. In addition to the shift in habitat of living resources discussed above, changing ocean and weather conditions due to human-induced climate change make any activities at sea more difficult to plan, design, and operate. In the United States, the healthy natural services (such as fishing and recreation) and cultural resources provided by the ocean also play a large economic role in our tourism industry. Nationally in 2010, 2.8% of gross domestic product, 7.52 million jobs, and $1.11 trillion in travel and recreational total sales are supported by tourism.123 In 2009-2010, nine of the top ten states and U.S. territories and seven of the top ten cities visited by overseas travelers were coastal, including the Great Lakes. Changes in the location and distribution of marine resources (such as fish, healthy reefs, and marine mammals) due to climate change will affect the recreational industries and all the people that depend on reliable access to these resources in predictable locales. For example, as fish species shift poleward or to deeper waters,65,67 these fish may be less accessible to recreational fishermen. Similar issues will also affect commercial fishing. The key message is supported by extensive evidence documented in the Oceans Technical Input Report1 and additional technical inputs reports received as part of the Federal Register Notice solicitation for public input, as well as stakeholder engagement leading up to drafting the chapter. There is high confidence that adaptation planning will help mitigate the impacts of changing ocean conditions. But there is much work to be done to craft local solutions to the set of emerging issues in ocean and coastal areas. Additionally, there is promise in restoring key habitats to provide a broad suite of benefits that can reduce climate impacts with relatively little ongoing maintenance costs (see Ch. 25: Coasts; Ch. 28: Adaptation). For example, if in addition to sea level rise, an oyster reef or mangrove restoration strategy also included fish habitat benefits for commercial and recreational uses and coastal protection services, the benefits to surrounding communities could multiply quickly. Coral-reef-based tourism can be more resilient to climate change impacts through protection and restoration, as well as reductions of pollution and other habitat-destroying activities. Developing alternative livelihood options as part of adaptation strategies for marine food-producing sectors can help reduce economic and social impacts of a changing climate. Fishing in New England has been associated with bottom-dwelling fish for more than 400 years, and is a central part of the region’s cultural identity and social fabric. Atlantic halibut, cod, haddock, flounders, hakes, pollock, plaice, and soles are included under the term “groundfish.” The fishery is pursued by both small boats (less than 50 feet long) that are typically at sea for less than a day, and by large boats (longer than 50 feet) that fish for a day to a week at a time. These vessels use home ports in more than 100 coastal communities from Maine to New Jersey, and the landed value from fisheries in New England and the Mid-Atlantic in 2010 was nearly $1.2 billion.103 Captains and crew are often second- or third-generation fishermen who have learned the trade from their families. 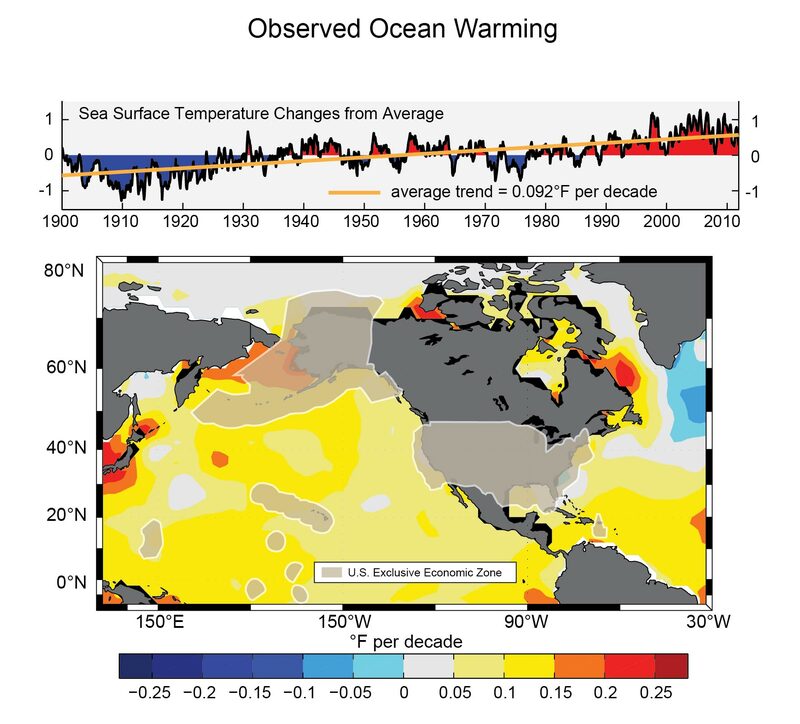 From 1982 to 2006, sea surface temperature in the coastal waters of the Northeast warmed by close to twice the global rate of warming over this period.136 Long-term monitoring of bottom-dwelling fish communities in New England revealed that the abundance of warm-water species increased, while cool-water species decreased.65,137 A recent study suggests that many species in this community have shifted their geographic distributions northward by up to 200 miles since 1968, though substantial variability among species also exists.65 The northward shifts of these species are reflected in the fishery as well: landings and landed value of these species have shifted towards northern states such as Massachusetts and Maine, while southern states have seen declines (see Figure 24.5).